Attributing a single cyber-attack is a hard task and often impossible. However, when multiple attacks are conducted over long periods of time, they leave a trail of digital evidence. Piecing this together into a campaign can help investigators to see the bigger picture, and even hint at who may be behind the attacks. Our research into malware used on SWIFT based systems running in banks has turned up multiple bespoke tools used by a set of attackers. What initially looked to be an isolated incident at one Asian bank turned out to be part of a wider campaign. This led to the identification of a commercial bank in Vietnam that also appears to have been targeted in a similar fashion using tailored malware, but based off a common code-base. In the bank malware cases we know of, the coders used a unique file wipe-out function. This implementation was so distinctive that it further drew our attention – and so we began to look for other instances of code which had used the same function. Using disassembled machine opcodes (with masked out dynamic virtual addresses) we generated signatures to scan a large malware corpus. Our initial search turned up an additional sample which implemented the same wipe-out function. Next, it recreates its configuration file wmplog09c.sqm in the same directory. As in case with the malware described in our blogpost, it will also install itself as a system service. The service will be called "Indman", "Indexing Manager", and described as "Provides fast indexing service". If the configuration file is missing, the bot initiates a default configuration and saves it to the wmplog09c.sqm file, located in the same directory. The default parameters specify 127.0.0.1 (local host) and port 443 as the default address for the C&C server. In this case, the bot expects the C&C server's IP address and port number to be passed as the command line parameters. These parameters are then used to update the configuration file. Since the configuration file is not available for analysis, the C&C IP remains unknown, but the port number is likely to be 443, same as the default value. Every 5 minutes it initiates a communication to the remote C&C. All communications are encrypted. The beacon signal it sends contains the local IP address. The data it receives from the C&C is first decrypted, and then used to update its own executable and the wmplog09c.sqm configuration file. The updated executable may have additional functionality that is missing in the analysed sample. The batch file format is identical to the one previously reported by Novetta. In order to delete its configuration and log files, the bot calls an internal function that wipes these files out so that their contents cannot be forensically restored. The implementation of this function is very unique - it involves complete filling of the file with the random data in order to occupy all associated disk sectors, before the file is deleted. The file-delete function itself is also unique – the file is first renamed into a temporary file with a random name, and that temporary file is also deleted. 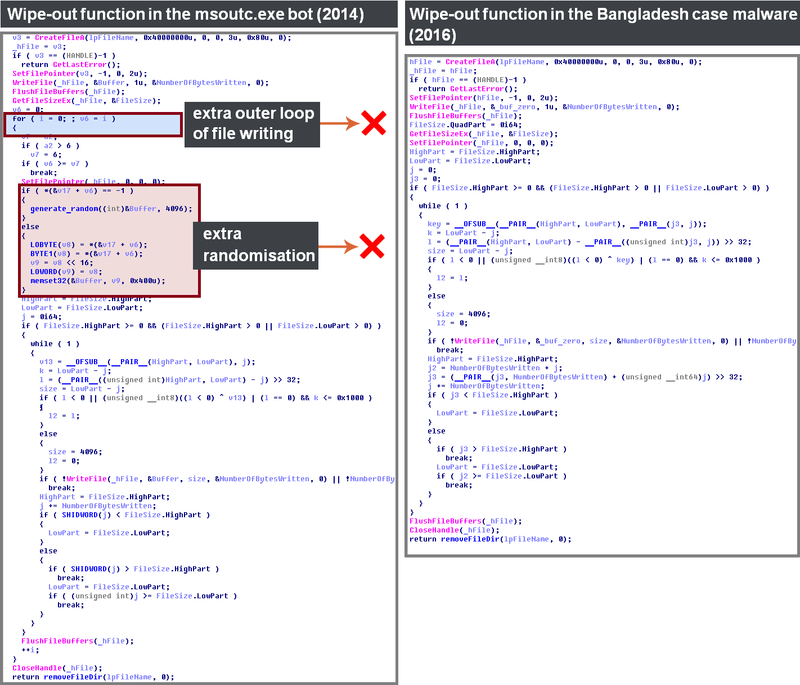 Let's compare the wipe-out function employed by this bot to the wipe-out function within the malware that was involved in the operation against the bank in Vietnam. The first instruction is to assign 0x1020 to EAX - this instruction is represented with an opcode B8 20 10 00 00, and it stays the same across the compared samples. The second instruction is to call a function located at the address calculated as the address of the next instruction (push ebx) plus 0x4EA96. Depending on a sample, the compiler may place __alloca_probe() function at a different offset within the executable, hence the 0x4EA96 offset is dynamic and the opcode bytes 96 EA 04 (representing 0x4EA96) should be ignored in our comparison. The API GetTickCount() is called with the last instruction, but again, the pointer into the API is stored in this particular sample at the virtual address of 0x45F04C. In a modified sample with a different image base, the virtual address of this pointer will also be different. Hence, the bytes 4C F0 45 (representing 0x45F04C) should also be masked out (ignored). Using this principle, full comparison of this function's implementation can now be done. NOTE: the greyed-out areas correspond to the virtual addresses of the called APIs – these addresses would not be expected to be constant across different samples, and hence, should be ignored. The wipe-out function used in the Bangladesh malware case was slightly different: the author removed one outer loop from the writing into the file, and one randomisation layer, as shown below. However, the core of the function was left intact. At the end of the file writing, the wipe-out function makes a call to a file-delete function that removes the file/directory – this is named removeFileDir() in our reconstructed code. So what else do we know about msoutc.exe? It turns out that this malware exhibits the same unique characteristics, such as mutex names and encryption keys, as other tools from a larger toolkit described in US-CERT Alert TA14-353A. The US-CERT alert mentions "a major entertainment company" and is widely believed to describe the toolkit used to conduct destructive cyber-attack which took place in late 2014. Further details of this same toolkit were disclosed in the 'Op Blockbuster' report in February 2016.
msoutc.exe matches the description of the 'Sierra Charlie' variants in their report. From their analysis this is described as a spreader type of malware, presumably used to gain a foothold on multiple devices within a target environment before launching further actions. Typos are not uncommon in cyber-attacks, as developers and operators rush through their tasks in an effort to stay ahead of network-defenders. However, this provides another soft link across the different sets of activity. The coder makes exclusive use of Visual C++ 6.0, an older development environment released in 1998. The use of such infrastructure for development is not unheard of, but it does leave a distinctive tool-mark with which to link the malware samples. The use of this compiler was also noted in the 'Kordllbot' samples described in a recent report by BlueCoat. This report details the same activity as discussed in the Operation Blockbuster reports. As noted already, the developers coded a specific function for securely erasing files from disk. The author of this function took great care in writing a large amount of random data into a file, before passing it to a file delete command. This was done in order to make sure the deleted file could not be forensically restored as all the original contents of the hard disk sectors associated with the file would be lost. The overlaps between these samples provide strong links for the same coder being behind the recent bank heist cases and a wider known campaign stretching back almost a decade. It is possible that this particular file-delete function exists as shared code, distributed between multiple coders who look to achieve similar results. However, we have noted that this code isn't publically available or present in any other software after searching through tens of millions of files. The unique decision to move and rename the file before deletion after overwriting is unusual, and not a common step we would expect to see when implementing this capability. A motivated and talented coder could implement the same function and choose to compile their project in Visual Studio 6.0 to achieve the same binary result for the purposes of misattribution. We cannot prove for certain that this is not the case, and further investigation of command infrastructure and related tools is needed before any definitive statements on attribution can be made. Whilst there are possibilities that exist which may lead to alternative hypotheses, these are unlikely and as such, we believe that the same coder is central to these attacks. Who the coder is, who they work for, and what their motivation is for conducting these attacks cannot be determined from the digital evidence alone. However, this adds a significant lead to the investigation.